PORT-AU-PRINCE, HAITI — Doctors treated more than 3,200 people at impromptu aid stations recently thanks to donations from the Haiti Lutheran Mission Society (HLMS). In the weeks after a 7.0-magniude earthquake struck the tiny Caribbean nation, the HLMS wired about US $15,000 to l’Eglise Lutherienne de la Foi (Faith Lutheran Church) in Gonaives, Haiti, the mother congregation of l’Eglise Lutherienne de l’Haiti (LCH). Faith Lutheran Church used the money to purchase supplies and rent trucks. On January 29, Faith Lutheran Church delivered two truckloads full of aid to Village la Saline, one of Port-au-Prince’s poorest neighbourhoods. Accompanying the aid were two doctors and 25 helpers. “The doctors had two tables set up that were quickly laden with medicine, and one line was formed in front of them,” according to a submission to the Canadian Lutheran from the HLMS. At a table at the end of another line, women handed out food packets containing rice, soy beans, smoked fish and water. At two more stations, church members prayed with residents and counselled them for trauma. Work continued until darkness and resumed the following morning. Faith Lutheran Church planned to run two similar aid stations in another area of Port-au-Prince in the coming weeks. 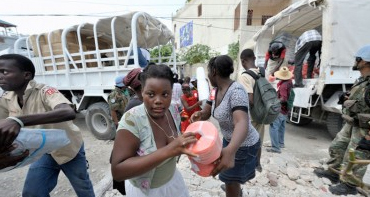 Meantime, Canadian Lutheran World Relief has raised more than $400,000 for Haitian earthquake relief. Action by Churches Together (ACT) Alliance, an international group of churches and related agencies dedicated to saving lives and supporting communities, is also taking action. Rev. Revenel Benoit, president of LCH, thanked all the Lutheran donors in Canada and HLMS for their contributions. “Please pray for us so that the Lord can continue to use the LCH to serve, help and assist so many hurting people,” he said. Donations may be sent to HLMS, 400 Glenridge Ave., St. Catharines ON, L2T 3L2.